This article is featured in "Women and the Workplace," a weeklong series exploring a variety of issues affecting modern working women. WASHINGTON, D.C. -- Americans are still more likely to say they would prefer a male boss (33%) to a female boss (20%) in a new job, although 46% say it doesn't make a difference to them. While women are more likely than men to say they would prefer a female boss, they are still more likely to say they would prefer a male boss overall. These results are based on Gallup's annual work and education poll, conducted Aug. 7-10. In 1953, Gallup first asked Americans, "If you were taking a new job and had your choice of a boss, would you prefer to work for a man or a woman?" 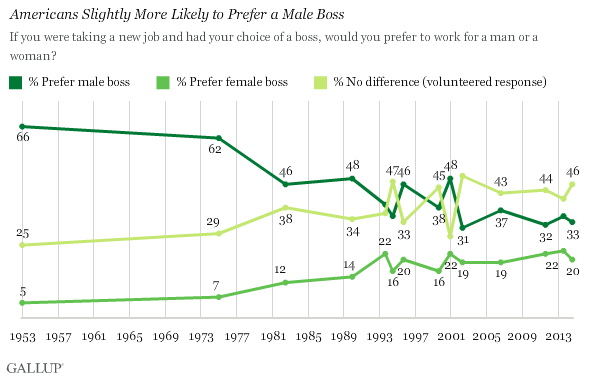 At that time, 66% of Americans said they preferred a male boss. Five percent said they preferred a female boss, and 25% volunteered that it made no difference. In an age when women are told to "lean in" to get positions of power at work, even women are more likely to prefer a male boss to a female boss. However, women have historically been more likely than men to prefer a female boss, although support for preferring a female boss has grown among both groups over time. In 2014, 25% of women say they would prefer a female boss, compared with 14% of men. The percentage of women who would prefer a female boss has never surpassed 30%. Currently, both genders would prefer a male boss, with 26% of men and 39% of women saying they would prefer a male boss if they were to take a new job. Men are more likely than women to say they have no preference -- 58% mention this response, compared with 34% of women. The survey indicates that 51% of working Americans currently have a male boss and 33% have a female boss. Those who have a female boss are more likely than those with a male boss to say they would prefer a female boss if they got a new job (27% vs. 15%, respectively). 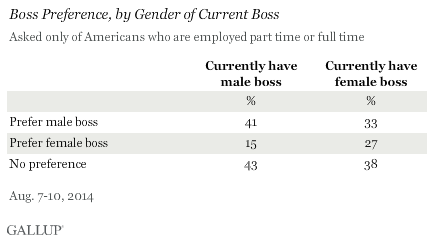 As Gallup has previously noted, younger Americans are slightly more likely than older Americans to prefer a female boss; however, preference for a male boss is consistent between the two groups. Republicans are more likely to prefer a male boss (42%) to a female boss (16%), while Democrats break even between the two -- 29% prefer male, while 25% prefer female. In June, Fortune reported that the number of female CEOs of Fortune 500 companies had reached a historic high, yet only 4.8% of this elite group are women. And while bestselling books like Lean In by Sheryl Sandberg push women to achieve their goals and focus on their careers, Americans' views about wanting female bosses haven't changed since Gallup began asking about them regularly in the 1980s. More Americans continue to prefer a male boss to a female boss -- although, since 2002, the greatest percentage continue to say it does not make a difference to them. While the percentage who prefer a female boss has grown over the last 60 years, it has never passed 25%. 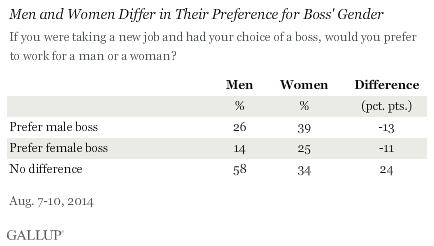 Women, however, are more likely than men to prefer a female boss, even if more women overall still prefer a male boss. Furthermore, workers who currently have a female boss are more likely than those who have a male boss to prefer a female boss in the future. This could mean that as more women enter management, preference for female bosses could continue to rise. Latin Americans are the least likely in the world to say women in their countries are treated with respect and dignity. A median of only 35% in 22 Latin American countries say this, versus medians of two-thirds or higher in other regions. Americans as a whole, and working women specifically, say that equal pay is the top issue for women in the U.S. workforce today, by a wide margin over other issues. Equal opportunity for advancement ranks second.